Posted by Bill Mann on Tuesday, January 15th, 2013 at 12:11pm. Mortgage rates rose last week nationwide during a week of sparse economic news. Thursday's weekly jobless claims report showed 371,000 new claims, which was 1,000 fewer jobless claims than for the prior week. Wall Street expectations of 365,000 new jobless claims turned out to be too optimistic. The semi-quarterly statement released Thursday by the European Central Bank (ECB) announced that the region's inflation remains below its 2 percent ceiling as established by central banker. Economic weakness in the Eurozone is expected to persist into 2013 with signs of recovery becoming evident toward the end of this year. ECB cited financial and structural reforms as essential to economic recovery, and noted that national governments within the Eurozone have been slow to implement such reforms. Without such reforms, Euro-area economies may continue to struggle, which would likely lead investors to seek a safe haven in the bond market, moving bond prices higher. As bond prices rise, mortgage rates in Coastal Delaware and nationwide typically fall. Also last week, Freddie Mac's Primary Mortgage Market Survey reported the average rate for a 30-year fixed rate mortgage rising from 3.34 percent to 3.40 percent for buyers paying 0.7 percent in discount points plus closing costs. The average rate for a 15-year fixed rate mortgage rose from 2.64 percent to 2.66 percent. Required discount points for the 15-year fixed rate mortgage rose from 0.6 to 0.7 percent. Import prices for December released Friday were reported at -0.1 percent, below the consensus estimate of +0.1 percent. This report measures the prices of goods purchased in the U.S, but produced abroad and is considered an important indicator of inflationary trends affecting internationally produced goods. Inflation tends to harm mortgage rates. Next week's economic calendar is full of economic data and includes the release of the Producers Price Index (PPI), Retail Sales figures, the Consumer Price Index (CPI). The Fed is also set to issue its Beige Book report, and the NAHB Housing Market Index and Consumer Sentiment report will be released. 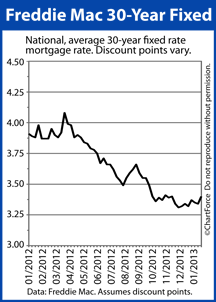 Mortgage rates remain low, but are rising.